Mary was born November 14, 1939 in Keyesport, IL to Joseph and Letty (Smith) Nordike.. She married Louis Shepard on September 15, 1956 in Keyesport, IL. He died May 15, 1992. 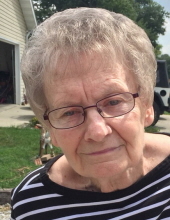 She is survived by her daughter Sherry (Russell) Sidwell of Brownstown and her brother Roger Nordike of Greenville, IL. She is also survived three grandchildren David (Nicole) Sizemore of O’Fallon, IL., Michael (Cass Spangler) Sizemore of Lake St. Louis, MO, and Stephanie Sizemore of Alton, IL. along with two great grandchildren Audrey and Brendan. She was preceded in death by her husband, three sisters Katherine Eveland, Dorothy Koeller, and Judy Matheny, and four brothers Jim Nordike, Dwight Nordike. Roy Nordike, and Bill Nordike. She grew up in Keyesport and graduated from Carlyle High School in 1956. After high school she attended cosmetology school and worked as a beautician. In 1980 she and her husband opened M & L Heating and Cooling. To send flowers or a remembrance gift to the family of Mary L. Shepard, please visit our Tribute Store. "Email Address" would like to share the life celebration of Mary L. Shepard. Click on the "link" to go to share a favorite memory or leave a condolence message for the family.